A secular ceremony, whether indoors or outdoors, provides wedding photographers with many more opportunities to make creative choices in how to document the event, including being much closer to the bride and groom during parts of their vows and, as in this image, toward the end of the ceremony just before they walk back down the aisle as husband and wife. Catching this angle shows a part of the story that can't be told from a more traditional church ceremony due to the restrictions often placed on photographers and videographers. For this reason we love working with secular ceremonies (or, in the rare cases that we encounter clergy who are willing to be more flexible, with any denomination at a church or other place of worship). 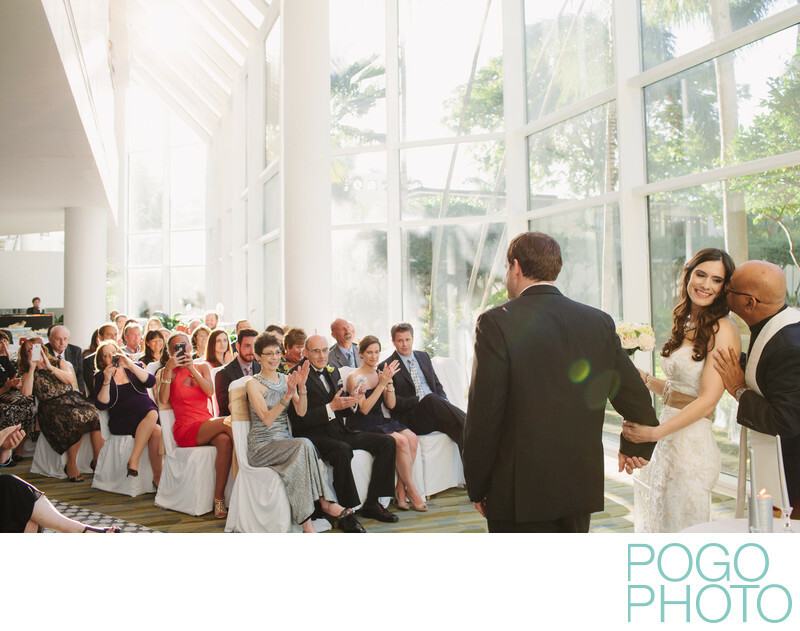 This particular ceremony space is a little known gem: the lower level of the Hyatt Pier 66 in Fort Lauderdale, Florida, this space has enormous clear windows that look out into the palm filled courtyard behind the building, flooding the room with light while remaining under cover and air conditioned, a rare treat in South Florida. Despite taking place in April, a month that's often quite cool and reasonable, this April wedding was quite warm, and choosing to have their ceremony indoors was welcome news to many guests who showed up worried about the unseasonably hot weather. We love the clean, modern lines of this space, drawing attention to faces (and cell phones, though that can't be helped), combined with an almost garden feel to an indoor space. Location: Hyatt Regency Pier 66, 2301 SE 17th Street, Fort Lauderdale, Florida 33316. 1/400; f/4.0; ISO 1000; 35.0 mm.